MY YORKIE RUSSELL IS 2 YRS OLD AND 19 POUNDS. MOM WAS JACK RUSSELL, DAD WAS YORKIE. VERY GOOD DOG. LOVES TO PLAY. Our Bella is 7 months old and weighs 13lbs already. She is very hiber. her mother was a yorkie and her father a jack Russel. She has 1 sister. Bella looked like the mother but has wirey black hair and her face has white hair m ixed in but she is much bigger than a yorkie. The breeder did not mean for them to be breed. 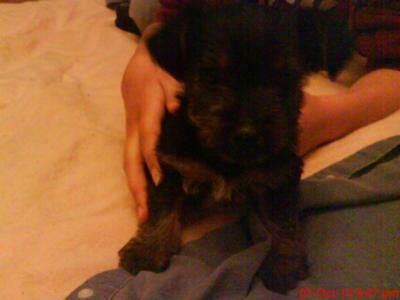 She had a male yorkie too but accidently the Jack Russel was with the female yorkie and here Bella is. Hi, Our Sadie is now 10 years old and she has been a great addition to our family. I can tell you a lot about her, she is Small but Quick, she can jump some distance and loves to play "Rabbit" and "Ball". She loves to cuddle under the covers to sleep and she almost always is ready at the Aim of you coming in the door to play, but Happy as a lark to see you. They are VERY SMART LITTLE DOGS in one complete package! She weights approx: 12 pounds now and was 4 pounds when we got her. Email me if you are interested to see pictures of Sadie. I think that I agree with Ladyjack. I don't think the pup will be very big. Not seeing the mom and dad makes it somewhat hard to determine though. Very nice looking JRT mix. I see more of the terrier than the JRT in the pup. Mixes are great because they have less health problems and are less hyper than the pure breed JRT's. Stef, BE, JRT Lover from Texas! What a super little dog, I don;t think he will grow very big at all, but you may get answers from someone that has a Yorkie cross.